For those of you still feeling sore over your disappointment in old man Indiana Jones from last summer's Crystal Skull movie, Up is here to soothe your pain. Finally the movie about a geriatric explorer we've been waiting for! I'm not joking. It struck me about 2/3 through this new Pixar outing, a strange and clever amalgam of comedy, adventure, and some heart-rending pathos. 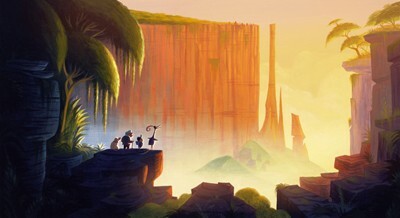 The hero of the film, the older than dirt, loveable curmudgeon Carl Fredricksen (voiced by Ed Asner), is living the childhood dream of anyone who ever watched an action serial or dreamed of visiting faraway places in search of wonder. That was his dream, too, and the movie even tells us so, opening with the childhood version of Carl oohing and ahhhhing over the newsreel reports of the ups and downs of zeppelin-flying, canine-loving explorer Charles Muntz (Christopher Plummer). The desire for thrills in distant lands also bonds the boy with Ellie, a gap-toothed girl (voiced by the director's daughter, Elie Docter) who grows into the love of his life. Carl always promised Ellie that he'd take her to Paradise Falls, the remote South American location where Charles Muntz disappeared to, vowing never to return unless he could prove the elusive giant bird he had discovered was for real. Life, however, gets in the way, and flash forward to old age, where a senior Carl has lost his wife, progress is threatening his home, and the world has lost most of its magic. Rather than give in or give up, Carl attaches a ton of helium-filled balloons to the house he shared with his wife, enough to lift it off the ground so that he can float it down to Venezuela. Only wrinkle: he's accidentally taken pudgy Wilderness Scout Russell (Jordan Nagai) along with him. The boy is a motor-mouthed helper whose help is generally more of a hindrance, but whom Carl is stuck with nonetheless. Both of the fellows have abandonment issues, and they are going to need one another if they're ever to get over them. The two put the old house down in the proximity of Paradise Falls, though on the wrong side of the ravine. Thus, they are tasked with dragging it to the right spot before the balloons lose their buoyancy completely--and therein begins the adventure. Strange birds, talking dogs, and dusty old secrets wait for them in the jungle. So does humor, clever concepts, and more tricky twists than most studios can squeeze out of an entire summer. Pixar always manages to wring the most out of every film. Really, they should teach a class. They even manage to do it without resorting to cheap pop culture moments that have long passed their sell-by date or treacly song and dance numbers. Seriously, Pixar, teach a class! The other guys need your help! Directed by Pete Docter (Monsters Inc.) with Bob Peterson, both of whom also get writing credits, Up is a movie that would take pages to explain, and even then, I'd not have covered it all. Nor will I have done it--or you--justice. It's best just to go to the theatre, get comfortable, and let the movie run. It's a film so daring, so surprising, each new unpredictable turn makes the adventure all the more thrilling. Which is exactly the point of the movie--be prepared for whatever may come and do your best to enjoy it when it does. This means the good and the bad, the funny and the sad. In fact, the first ten minutes of Up features some of the most endearing and heartbreaking material I've seen in many a year. If you don't have a lump in your throat when Carl takes his single seat out on his porch, you might as well get up and go, the rest of it is going to be wasted on you. As always, the animation in Up is flawless. Pixar has gotten so good at what they do, it has ceased to require the viewer to stop and marvel at their artistic efforts. The magic is too engrossing, the curtain is never visible. Well, except for the 3-D. I've already grown tired of this fad, I'll admit. Sure, it looks fantastic, and thankfully, it's used sparingly in Up, but there are times where it's too much flash, where the story gets run off the road because I'm too busy looking at the passing scenery. I know beating the Pixar drum is becoming the predictable move anymore, but the animation studio really makes it easy by making their movies so undeniably good. They could easily coast at this point, and it would be just as easy to take them for granted, but one never gets the impression that the team has opted for the simple solution. Every frame of Up is thought through to the finest detail, and every behavior, be it human, dog, or what have you, carefully observed and replicated. The story is massaged in such a way that all of the required elements are in place, but so that the functionality is never obvious. Above all else, the folks putting it together never forget that entertainment is job one. Up is wonderfully inventive and original, crackling from start to finish with the same spirit of daring its characters are meant to find in their travels. I suppose you could not like it if you really wanted to, but why would you want to? 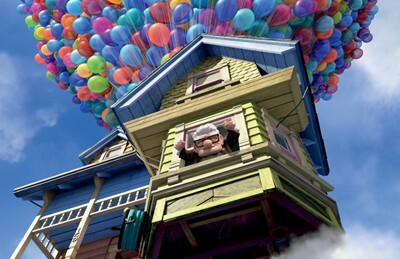 Buy tickets to "Up (Disney Digital 3D)" now!